Nellie Cashman’s Monday Club, named for Arizona’s oldest club for women, is a star within the Westin Kierland Resort and Spa. 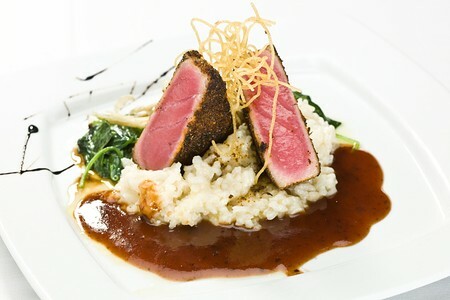 With an open-style kitchen, Executive Chef Jason Christie creates flavorful, healthy dishes. From gourmet salads boasting local organic ingredients to the nostalgic dinner entrees such as Roasted Half Chicken Provencal with fingerling potatoes, Nellie Cashman’s Monday Club offers a wide variety of options for its diners. The outdoor patios offer an incredible view of the McDowell Mountains, which complement the delicious cuisine. Situated in one of Arizona’s most luxurious spas, this eatery is ideal for a quick bite before a spa appointment and for an elegant dinner to conclude the evening. | All Day 6 a.m. - 9 p.m.